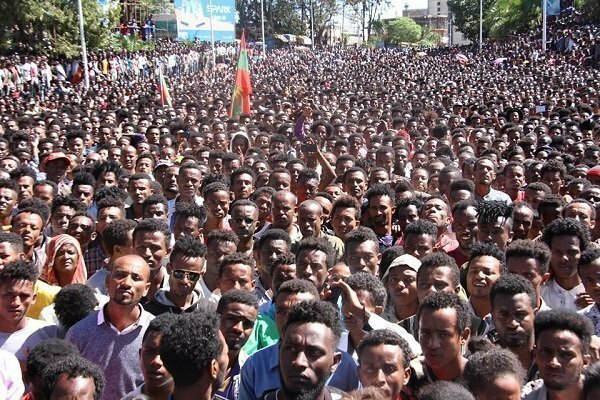 Ethiopians in Oromo region demand government to take actions on entities responsible for atrocities committed in East Wollega and other areas adjacent to Benishangul Gumuz region, in the western parts of the country. According to a report by Fana Broadcasting Corporate, residents of Ambo, Ghimbi, Holeta, Burayu, Bako and Metu towns took to the streets today. Protesters chanted slogans calling on Ethiopian government to end killings and displacement of people in the region. No incident of violence or causality is reported for the protests have concluded peacefully based on Oromia Regional State Communications Bureau statement which is cited by FBC. Furthermore, the office says that it has been coordinating with Benshiangul Regional State authorities to overcome the security challenge that is causing loss of civilian lives but unable to halt it within shortest time for those who are launching the attacks are armed with heavy weaponry and that their attacks are coordinated. Yesterday, National Security Council passed a decision to deploy federal security forces to the region following the request by the two regions, and the forces have already entered the area at this writing. So far, as many as 200 people are in custody in connection with last week’s killings in the region. More than 15 Oromia regional state police and dozens of civilians were killed in East Wollega zone. Government authorities seem to think that entities behind the security crisis in the region are those who have been repressing the people for a long time and recently lost their power due to the ongoing change in the country. Their action is aimed at reversing it according to government narrative which is also calling on the people to work with government security forces to stop criminals and restore peace in the region. On the other hand, there are also claims that OLF elements who drifted from the organization are part of the problem. OLF has not yet issued a statement regarding accusations against those who are allegedly left the organization and still operates with its name. In a similar development, there was a massive protest in Butajira, Southern Ethiopia, yesterday which was organised to protest lawlessness, killings of civilians and displacement. Dozens of people were killed recently in Meskel and Mareko region of the area. People seem to believe, like Ethiopian government, that disenfranchised political elites who seek to reverse the ongoing change in the country are behind the problem. 2 Responses to "Protesters in Oromo region of Ethiopia demand an end to security crisis"
Our people must got agood response for his question.